From a distance, the scene looks and sounds not unlike a standard fair-weather gym class. Players clad in mismatched jerseys dart back and forth, colorful vinyl strips streaming in their wake. Shouting, laughter, and the faint strains of Britney Spears’s “Toxic” mingle with the sound of cleats (alongside sneakers, from those less equipped for the scrimmage) and, occasionally, bodies hitting the ground. The one downside of the weather—sunnier, drier, and more temperate than seems possible for Providence in April—is that the smell of sunscreen is overwhelming, even from several yards away. This is the Providence Gay Flag Football League (PVDGFFL)’s second-ever scrimmage. Four of the league’s eight teams spread out across the North Country Club Field in Warwick, preparing for the day’s first round of preseason matches. At this point, teams have known each other for only a week. But next weekend, they will be competing in their first game of the PVDGFFL’s inaugural regular season. Now is the time for teams to coalesce, develop game strategies, and, hopefully, decide on names. Officially, each team’s name is designated by its jersey color, but players and captains alike are, to varying degrees, interested in finding more exciting alternatives. The Green Team seems to be known interchangeably as “Mountain Doobie” and “Mount and Do Me,” while the Red Team is torn between “the Red Beards” and “Red Rocket.” Alex L’Ecuyer, captain of the Blue Team, informs me that his players are going by “the Blue Cockies,” which originated as a “bar joke.” “Hey, everybody thought it was hilarious,” L’Ecuyer adds, laughing. The players present today came to the PVDGFFL from many different athletic backgrounds and with many different skill sets. But all have two things, at least, in common: the desire to carve out a new LGBT community space in Providence and the will to play football. As administrators drag out goalposts and refs take to the field in preparation for a day of games, both aims start to materialize. As the first set of games start, positions still seem up in the air—the PVDGFFL is many players’ first exposure to football, flag or otherwise, and these early rounds are an opportunity for learning and teaching. The rules of flag football and tackle football are very similar, though flag leagues vary in their treatment of contact, field size, and other specific regulations. As a rule, flag is much lower-contact than tackle football, if not completely no-contact. Stripping a player of their vinyl flags, attached to their waist, amounts to a tackle and ends the opposing team’s play. It’s customary for the player who succeeds in taking another’s flags to hold the colorful strips high above their head in the universal gesture of athletic accomplishment—see Rocky with his belt, any given championship-winning hockey player with the Stanley Cup, or a wrestler performing a fireman’s carry of their opponent’s entire body. Harley Jones is on the field for most of the first set of games. Her goal in joining the PVDGFFL is to meet people. “I don’t have very many friends in this area in the LGBT community,” she tells me. “I’m here to become more active.” She was also drawn in by the opportunity to participate in organized sports. “I did cross-country in high school, and I missed the team bonding,” she says. She brought a fan, her friend Andrew, who isn’t registered with the PVDGFFL but came to watch her in the scrimmage. “I’m straight, for the record, but I’m very supportive of the community, especially if there’s sports involved,” he says. His interjection is cut off by Jones’s thunderous cheers. Her team, Mountain Doobie/Mount and Do Me, has just scored against the still-unnamed Navy Team. Jones’s motivations for joining are typical among newcomers to the PVDGFFL. Jay Noble, who moved to Providence less than a month ago, also registered in order to meet people and “stay active.” Noble, like several other players at the scrimmage, had previously participated in a (predominantly gay) women’s flag football league in St. Louis. Providence, too, has a women’s league, which many PVDGFFL participants also play for. Gay leagues can also provide a familiar space for those in the process of acclimating to a new identity and community. John Zajicek, assistant commissioner of the PVDGFFL, joined a gay kickball league in Orlando within months of coming out. For him, gay sports leagues were a way to bridge the gap between his current life and a future of deeper engagement with other LGBT people. “I’d grown up playing sports, so to find out that there were these leagues that existed, and that identified with the kind of lifestyle or activities that I was normally part of ... that was my step into meeting people in the community.” The PVDGFFL is, first and foremost, a space for LGBT people to connect—with each other, but also with themselves. The PVDGFFL is far from the only space in Providence with the goal of bringing LGBT people together in community. For a city of its size, Providence has an unusually large number of gay bars. Historically, these have been centers of LGBT community in the area. But many LGBT residents of the Providence area are reaching for spaces outside of bars, as well. Mike Ung, a player for the Blue Team, called the PVDGFFL an opportunity for LGBT people to meet each other “doing something that’s not just going out to bars and all that.” He is far from the only player who mentioned the PVDGFFL’s relationship to gay bars—their similarities and, implicitly, their differences. The comparison of gay sports leagues and gay bars is far from new. A 2013 Los Angeles Times article headlined “Gay sports leagues gain ground against bars as a social outlet” made as much clear. Taken at face value, this article reads like a proclamation of a new era of gay spaces, where bars are obsolete and queer people only ever congregate to practice kickball (specifically without “waving flags,” according to one man interviewed in the Times article). But the dichotomy between sports and bars isn’t as clear, or as competitive, as it might appear. The PVDGFFL has reached out to many other kinds of gay community spaces, including, but not limited to, gay bars and clubs across Providence. It has brought in players through queer centers on and off college campuses, mutual friends, and simple social media promotion. The assumption the Los Angeles Times article makes, that a gay sports league would necessarily drain energy from other kinds of community spaces, carries with it the idea that there is a limit to queer people’s ability or desire to connect with each other. To anyone watching this scrimmage unfold—the laughter, the cries of triumphant glee, the joy in connection—this assumption is self-evidently wrong. However, recruitment does present challenges for the PVDGFFL, especially within the 18-to-32 demographic. “What does socialization look like for the queer community? Now, more than ever, a lot of it is digital,” Zajicek told me, mentioning the prevalence of dating apps. When so many introductions and interactions between queer people occur online, Zajicek thinks it can be difficult to mobilize interest in building offline spaces. Despite the accessibility of online platforms, though, many young people continue to register for and show up to gay sports leagues. But, to some degree, these leagues have to compete amongst themselves for interested players. Between the Renaissance City Softball League, the Gala Bowling League, and the Ocean City Pride Volleyball League—not to mention countless other gay leagues in the Boston metro area, including FLAG, one of the largest gay flag football leagues in the United States—Providence is already home to many options for hopeful athletes in the LGBT community. But even with these many outlets, the PVDGFFL has attracted a full roster. They also have sponsorships to back them up, including doTERRA Essential Oils (whose representative Kaleb Bajakian mans a booth at the scrimmage). 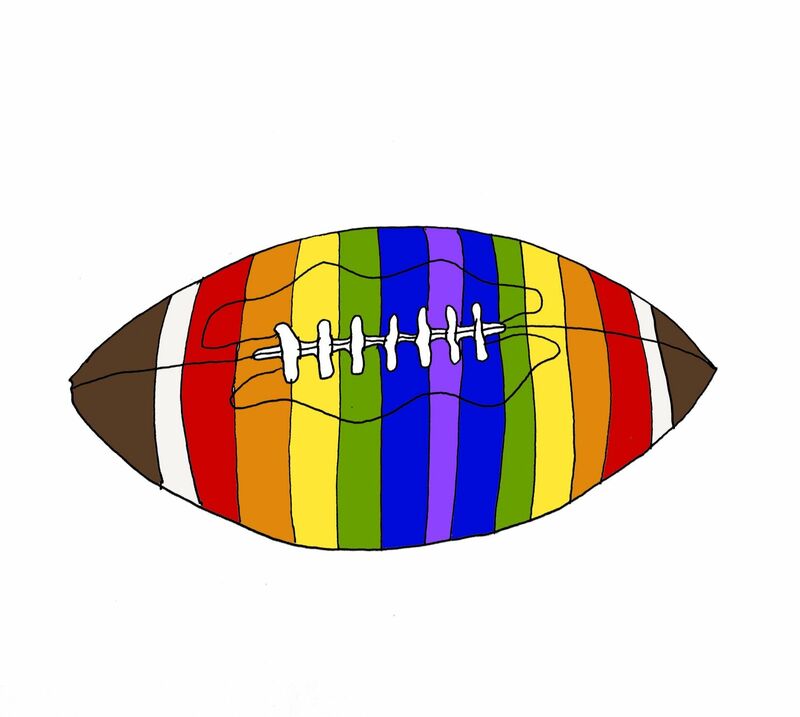 Many players participate in multiple other gay and women’s sports leagues in Providence in addition to the PVDGFFL. Come the end of the first set of games, with no scoreboards in sight, it’s only really possible to determine the victor based on Mountain Doobie/Mount and Do Me’s players’ cheers. More important than final scores seems to be the end-of-game chants, which, for Mountain Doobie/Mount and Do Me, involve each team member shouting their preferred pronunciation of the team’s name at the top of their lungs. As players begin to unlace their shoes, zip their bags, and set out for the parking lot or the sidelines, a new wave moves in for the next round of matches. These teams are all competing, but the object, especially today, isn’t really to win; it’s to build something together. The PVDGFFL may be made up of rookies, but they’ve proved themselves up to that challenge. CATE TURNER B’21 has the shakiest possible grasp on the rules of football, tackle or otherwise.